Windows XP Embedded delivers the power of Windows XP Professional in a componentised form. Each component includes data that allows you to mix and match with other components and build a customised operating system into a runtime image. Windows XP Embedded is designed to reduce development time and costs due to its compatibility with commodity PC hardware, applications, drivers, and services that also allows the user to use less expensive and smaller hardware solutions. AMC can create a fully customised Windows XP Embedded environment for whatever the target application is with just the functionality your hardware requires. Windows XP Embedded isn�t just a stripped down form of Windows XP Professional. Microsoft makes the components available that allows the customer to have the same functionality as a full version of Windows XP Professional but with many specific embedded enabled features that help optimise the operating system for embedded devices. Enhanced Write Filter (EWF) to protect disc volumes. Hibernate Once/Resume Many (HORM) for �instant on� experience. System cloning tool streamlines manufacturing process. Windows XP Embedded offers an Enhanced Write Filter (EWF) which protects the boot partition from unauthorised modification or corruption by any source, power outages, conflicting applications, user interference etc. EWF works by making a RAM Overlay. This protects the boot image no matter if it is on a hard drive or a Compact Flash drive. If a corruption does occur or unauthorised software is installed, a simple reboot and the system will return to its original state. Allows you to hibernate a machine one time and then resume from that hibernate point again and again very quickly. Each time you turn on the machine, you will only need to wait a few seconds to have everything up and running again. Windows XP Embedded can be tailored down in functionality to just what�s needed for the customer�s application. In most cases the customer can get away with less RAM and storage space, and in some cases lower CPU performance than with an XP Professional installation. Windows XP Embedded systems can support smaller, lower powered hardware reducing cost as well as power consumption. AMC are able to work with the customer to design bespoke embedded computer products that can be compact, fanless, low power and IP rated if necessary. Rreduce/restricted functionality means that less opportunity for possible security attacks. Windows XP Embedded SP2 also supports File Based Write Filter. Writing to storage media may be undesirable or impossible in embedded devices. FBWF redirects all writes targeted for protected volumes to a RAM cache called an overlay. Used in this context, an overlay is similar to a transparency overlay on an overhead projector. Any change made to the overlay affects the picture as seen in the aggregate, but if the overlay is removed, the underlying picture remains unchanged. Hibernate Once/Resume Many (HORM) allows devices such as thin clients to achieve an instant-on experience. Pre-boot Execution Environment (PXE) protocol allows communication with the server and retrieves a boot image over a network. This provides devices that do not contain a hard disk the ability for network booting and configuration. Microsoft Windows XP Embedded will run without a keyboard, mouse, or monitor. Microsoft Windows XP Embedded has the same functionality as Windows XP Professional with a license fee that is lower than the XP Professional license. 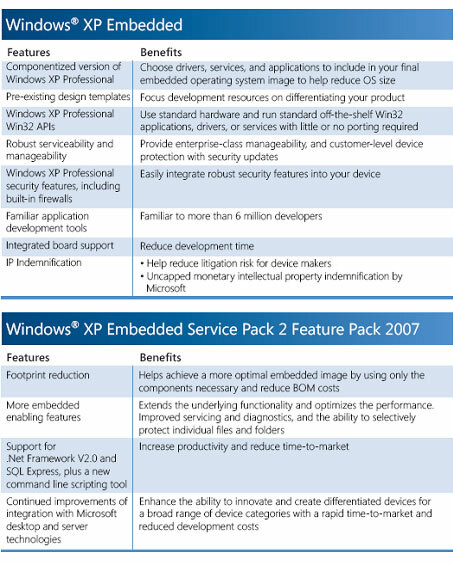 Windows XP Embedded uses the same binaries as Windows XP Professional allowing Windows based applications to run on Windows XP Embedded applications. Windows XP Embedded images can be very small, as little as 40MB in size. Lower device life cycle costs as XP Embedded is designed to run on standard x86 processor architecture protecting the customer�s investment. Implementation can include an embedded web server for host pages, a complete file server and terminal services. Build web pages with Microsoft FrontPage, Silverlight or any HTML editor. Windows XP Embedded includes an extensive set of device drivers that are delivered in source form to optimise embedded development. 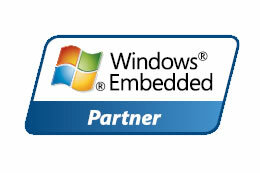 Windows XP Embedded has over 12,000 components available. Technologies such as Bluetooth, DirectX®, multimedia codecs and the .NET Framework. These technologies must usually be licensed separately for other embedded platforms from multiple vendors. Device Update Agent (DUA) helps make servicing embedded devices after deployment easier. A lightweight service that performs administrative tasks such as copying files, creating registry keys, and executing processes, DUA runs on the device operating system and works by polling a specific remote or local path for a script file. Ideal for kiosks or information terminals at airports that are not necessarily inside a corporate network. Microsoft Systems Management Server (SMS) is another option to service embedded devices running Windows XP Embedded. SMS manages clients in large, enterprise-level Windows environments.